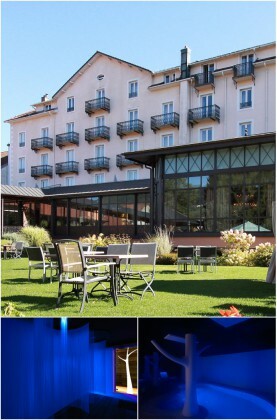 This is the spa from your dreams in the heart of Vosges, its pine forests and blue lakes. At the Grand Hôtel de Gérardmer, a simple posthouse transformed into a treatment centre in 1888, the Chênes Blancs spa represents a deep breath of fresh air: cork-oak walls and wooden slats mirror the façade of a traditional chalet. Here, the ceiling is covered into autumnal foliage: and there, cork-oak and fur adorn the walls.